What Kind of LED Christmas Lights Can I Get? LED Christmas lights are on the rise and people are starting to see the allure of their energy-saving glow. For some people, the switch from the conventional incandescent bulbs to LEDs can be hard because they’re afraid they’ll lose their selection of color, quantity and functionality. That concern is understandable, but there is no reason to worry as LED Christmas lights come in all sorts of varieties. There are dozens of websites selling almost exclusively LED Christmas lights. 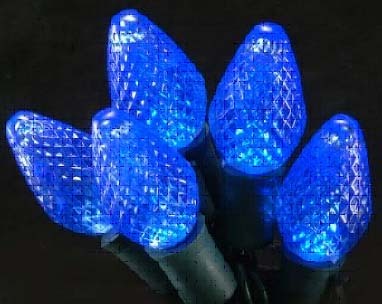 Sites such as holidayleds.com, ledholidaylighting.com and 1000bulbs.com are selling vast numbers of different LED lights. Surprising, the newer technology lends its hands to all the classics such as: white Christmas lights, blue Christmas lights and red Christmas lights. 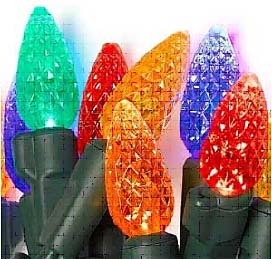 Holidayleds.com, for example, sells six different colors – in addition to the previous three mentioned, the website also sells purple, orange, green or a set of multi-colored lights. Beside the color variations, these websites provide different shapes and designs. Holidayleds.com sells strings with the traditional bulb shape, spherical bulbs, wide angle bulbs, strawberry-shaped bulbs and novelty bulbs such as icicle lights and flower-shaped casings. Now you may wonder if you’ll be missing the functionality from your old incandescent lights that wrapped your Christmas tree in warmth. Not to worry – LED Christmas light manufacturers have kept your blinking and chasing lights in mind when designing new wallet-friendly products. The website christmaslightsetc.com sells your favorite multi-function light sets from 15 to 200 bulbs per string. While the LED implementation into Christmas lights is still an ongoing process with a few kinks to work out, there is no doubt that the geniuses behind these lighting innovations are doing there best to serve the everyday, obsessive holiday decorator.